Spreading Aboriginal culture by providing specialised training programs leading to employment opportunities in the maritime industry. Leading on from the successful Senior Mentor program established in 2009, Tribal Warrior is now looking to the next generation who are ready to give back to their communities by becoming the first round of Junior Mentors. Tribal Warrior presented in Sydney at The Funding Network in October 2015 to supplement the mentoring program with additional wages for Junior Mentors, program consumables (such as petrol and breakfast food) and other core operating costs. 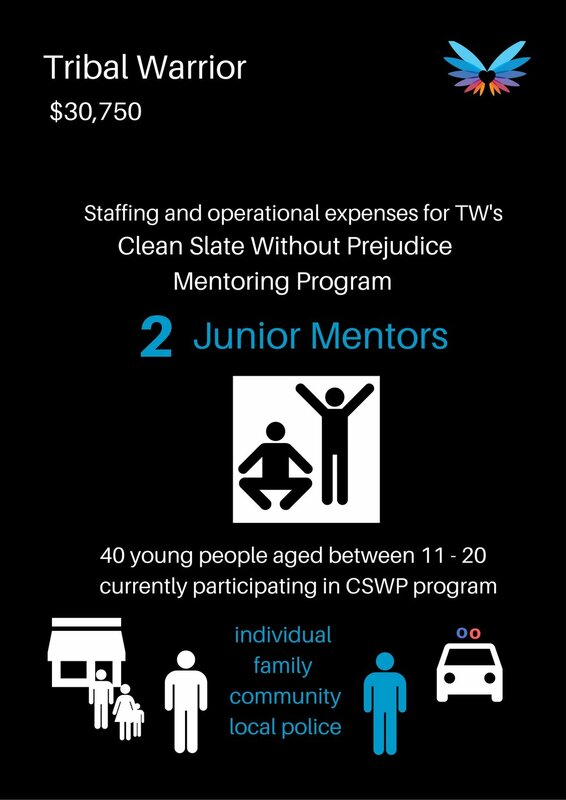 Tribal Warrior's 'Clean Slate Without Prejudice Mentoring Program' instils discipline, routine and structure for young mentees. It also reconnects them with their culture and encourages school or employment attendance. Consider the journey of a young program mentee - we'll call him Charlie - who joined the program two years ago with a reputation in the community as a troublemaker. Charlie was keeping bad company, taking recreational drugs and skipping school. Over time, he committed to the mentoring program: attending thrice weekly morning exercise sessions, living clean and behaving as a role model for other young mentees. His school performance has more than just improved - Charlie recently received a scholarship to complete high school. Funding two part time Junior Mentors - Jessie and Byron - has provided these older mentees with an empowering opportunity to develop leadership skills, assume a position of responsibility and positively influence the younger kids in their community. The CSWP Mentoring Program current mentors approximately 40 children between the ages of 11 and 20 years with positive impact that extends beyond individual participants to family and the wider community: Redfern community police (who closely monitor the statistics of crime in the local area) attribute reduced juvenile criminal activity (along with continually improving trends that compare favourably with the rest of the state) to the CSWP Mentoring Program. Learn more about Tribal Warrior.